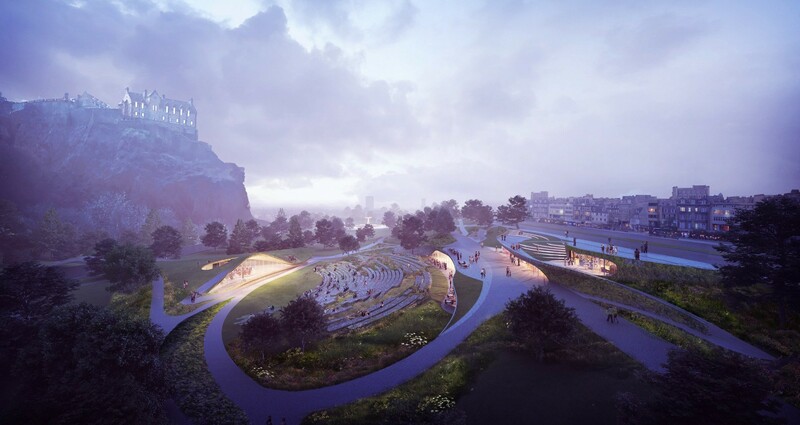 A fundraising campaign has been launched to raise capital in support of a wholesale reimagining of Princes Street Gardens to create a landmark destination at the foot of Edinburgh Castle. The Quaich Project is the brainchild of the Ross Development Trust which aims to establish a new venue on the site of the current Ross Bandstand. GRAS and wHY emerged as the winners of a design contest for the gardens back in 2017 but detailed design work has stalled amid concern over maintenance costs. 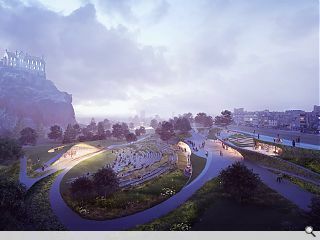 Resolution of these issues by allowing the council to retain control of the site will now see detailed design work undertaken over the next few months with a formal application being submitted early in 2020. Under its stewardship, the City of Edinburgh Council has pledged to host no more than five major events in the grounds each year, during which public access would be limited. Years of fundraising lie ahead before the vision has any chance of becoming a reality until 2023 at the earliest. Is this an improvement on what's there already, are they solving a problem that doesn't exist? Do we really want to dig up a perfectly nice park, putting it out of public access for several years? I also see that all the balustrades, to stop people falling off the edge of a sunken building, have been conveniently omitted from the images! Oh for crying out loud, just leave the perfectly good gardens alone!